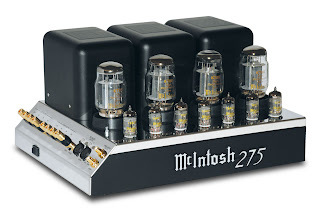 McIntosh MC275 was designed in 1961 and its still most popular among users. If you are new to McIntosh MC275 surely you get rich information here. The MC275 used an advanced design of this technology by incorporating a trifilar wound primary to improve the power bandwidth. The third winding is connected to the plates of the cathode follower driver. Groups of interleaved primary and secondary windings improve coupling and bandwidth of over 100,000 cycles is achieved. 2 - Selectable source input for Stereo, Twin-Amp or Mono operation. 3 - Output is rated at 75 watts continuous per channel in Stereo or Twin configuration. 150 watts continuous mono. 4 - Harmonic Distortion is less than 0.5% at rated output or less for 20Hz through 20kHz. Typical performance is 0.3% or less at 20Hz and 20kHz full power. Typical performance in the mid frequencies is 0.1% or less at full power. 5 - Output barrier strips provide taps for speaker impedance of 4, 8 and 16 ohms stereo or 2, 4 and 8 ohms mono. The terminal strips may also be connected for a constant voltage output of 25 volts in either stereo or mono, or for 70.7 volts in mono. The secondary of the McIntosh output transformer may be operated either grounded or not grounded. If grounding is desirable, a wire may be connected between chassis and common of either or both output terminal strips. 6 -An octal socket marked line output has connections for 70.7volts, 115 volts, 230 volts or 600 ohms for stereo 300 ohms for mono operation. The 600 ohm winding and the 300 ohm winding are balanced to ground. Pin 1 of the octal socket is the center tap for these windings and is grounded.